Diabetes mellitus is a group of metabolic diseases characterized by high blood sugar. This produces the classical symptoms of polyuria (frequent urination), polydipsia (increased thirst), and polyphagia (increased hunger). Type 2 diabetes mellitus (T2DM) results from the inability of the body cells to properly use glucose. T2DM is a metabolic condition, which has grown to epidemic proportions and contributes up to about 90% of all diabetes cases. In Ghana, the prevalence rates of 6.3% has been quoted. Recently, T2DM has been implicated as a risk factor for nephrolithiasis., While many other studies have established the prevalence of crystalluria in T2DM, others have demonstrated the high prevalence of particular crystals, especially uric acid. However, much still needs to be studied on what factors may predispose patients to crystalluria. Insulin resistance, the major characteristic of T2DM, is known to cause defective ammoniagenesis, leading to a reduced pH and enhancing the formation of crystals in urine. Furthermore, studies have shown that crystals in urine are more in diabetics than in nondiabetics. These prove that there is a link between T2DM and the formation of crystals, and this can be capitalized on in diagnosis and management of the condition and its ramifications. Despite this suggested theory, there may be other factors, which concurrently increase or reduce the risk of development of crystals in urine. Therefore, a study of crystalluria in T2DM patients is essential to prevent future urolithiasis and to protect the kidneys from the dangers associated with T2DM. The present study was to determine the prevalence, types, and associated risks for crystalluria among patients with type 2 diabetes mellitus. This will aid in the prevention or reduction of onset of crystalluria among type 2 diabetes patients. A case–control study with simple random sampling conducted at the Agona Swedru Municipal Hospital (ASMH) in the Central Region of Ghana from December 2012 to May 2013. Agona Swedru is the capital of the Agona West Municipal District in the Central Region. Two hundred and five participants comprising 165 T2DM patients (designated as cases) and 40 healthy nondiabetics (designated as controls) were recruited from the ASMH in Agona Swedru. Participants with other forms of diabetes (Type 1 diabetes and gestational diabetes), kidney disease, or familial history of recurrent kidney stones as well as participants on sulfonamides were excluded from the study. The blood pressure (BP) of participants was measured in accordance with recommendations of the American Heart Association  using a mercury sphygmomanometer (Accoson, Dekamet, England) and a stethoscope. Mean values of duplicate measurements were recorded as the BP. Weight (nearest 0.1 kg) and height (nearest 0.1 cm) were taken in light clothing and without shoes, from which body mass index (BMI) was calculated. 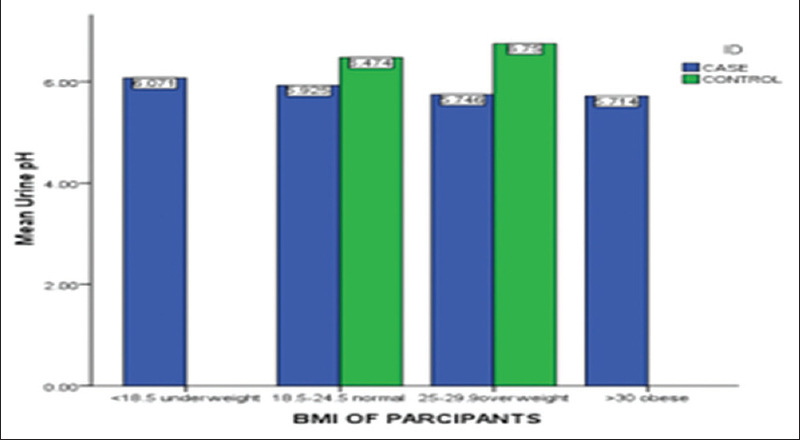 The participants were grouped into underweight (BMI <18.5 kg/m 2), normal weight (BMI 18.5–24.9 kg/m 2), overweight BMI (25–29.95 kg/m 2), and obese (BMI >30 kg/m 2). After overnight fasting (8–12 h), capillary blood samples were taken and glucose measured with a glucometer (ACCU-CHEK Performa, Germany). Ten (10) ml of early morning midstream urine was collected into a dry, sterile wide-mouthed container. Commercially available urinalysis reagent strips (CYBOW™ DFI Co. Ltd, Gimhae-City, Republic of Korea) were used to semi-quantitatively determine the following biochemical parameters in urine: urine specific gravity (USG), pH, protein, and glucose as per manufacturer's instructions. The urine was centrifuged at 1500 rpm for 5 min, and the deposit was thereafter examined microscopically using × 10 and × 40 objectives of a light microscope as appropriate. Statistical analysis was done with IBM SPSS Statistics for Windows, Version 19.0. Armonk, NY: IBM Corp. Continuous data were expressed as mean ± standard deviation and categorical data as frequencies and proportions. The independent samples t-test, Chi-square, and Fisher's exact test were used for comparisons of variables between the two groups. To determine independent variables associated with crystalluria, a multivariate logistic regression was performed, from which the adjusted odds ratio (AOR) was calculated. Pearson's correlation was used to determine the relationship between variables. All P < 0.05 were considered significant. Ethical approval was obtained from the Institutional Review Board of the University of Cape Coast and the Institutional Ethics Committee of the ASMH. Informed consent was obtained from all participants before enrollment onto the study. Mean age, BMI, and systolic BP were higher among case participants than controls (P < 0.001; P < 0.001; P = 0.018). Diastole BP, although higher in case participants, was not significant (P = 0.069). 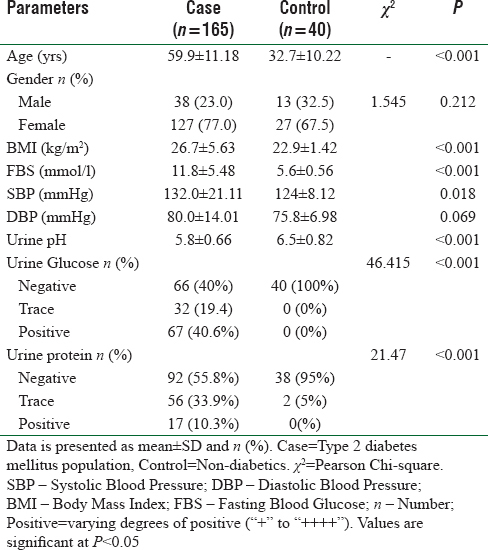 Fasting blood glucose (FBG) levels were significantly higher among case participants when compared to the control group (P < 0.001) [Table 1]. Table 1: Demographic, clinical and biochemical characteristics of study participants. All control participants had no glucose in their urine (negative) concentration (100%), whereas 40% of case participants had negative urine glucose. Of the 60% who had various degrees of glucosuria, 19.4% had trace amounts and 40.6% had varying degrees of positivity (“+”–”++++”). Proportion of individuals with the presence of protein and glucose in urine was significantly higher in cases than in controls (P < 0.001 each). Majority of control participants had no proteinuria with only 5% showing trace amounts. Urine was acidic in both groups, but control participants had a slightly higher pH than case participants (P < 0.001) [Table 1]. The trend of urine pH with BMI among case and control participants is shown in [Figure 1]. Urine pH increased with BMI in nondiabetics while the reverse occurred in type 2 diabetics. The proportion of crystals in urine among the total population in decreasing order of prevalence was calcium oxalate, uric acid, and tyrosine crystals. Type 2 diabetics had more crystals in their urine (17.5%) than the control participants (5.0%). The only crystal type found in the urine of the control group was calcium oxalate (5%). Less than one-fifth of diabetics had crystals in their urine with a crystal-type distribution of 12.7%, 3.6%, and 1.2% for calcium oxalate, uric acid, and tyrosine crystals, respectively [Figure 2]. 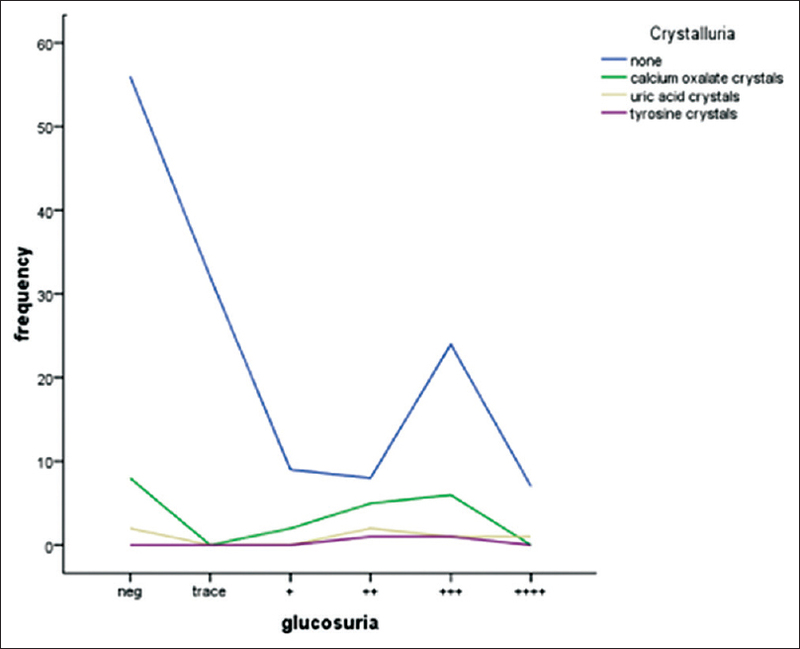 [Figure 3] shows the distribution of crystal species by urine glucose concentration in T2DM participants. There was increasing calcium oxalate levels with increasing glucosuria, at least to “+++” concentration of glucose in urine. This calcium oxalate crystalluria tendency then sharply decreases with glucosuria greater than “+++,” while at the same time, uric acid crystalluria appears to slightly increase [Figure 3]. Participants with crystalluria were slightly older than those without crystalluria. However, this was not significant (P = 0.151). There were more males without crystalluria (37.6%) than with crystalluria (17.3%). The reverse was, however, seen in the case of females, 82.7% and 62.4% with and without crystalluria, respectively. 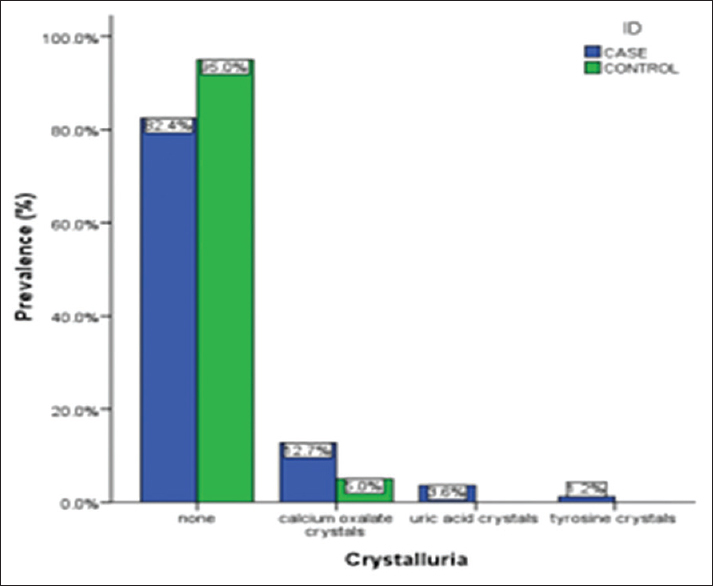 Crystalluria by gender did not differ significantly (P = 0.477; P = 0.475). Participants with crystalluria had significantly higher FBG levels compared to those without crystalluria (P ≤ 0.001). The former also had had T2DM for a longer period (9 years) than the latter (7 years) [Table 2]. 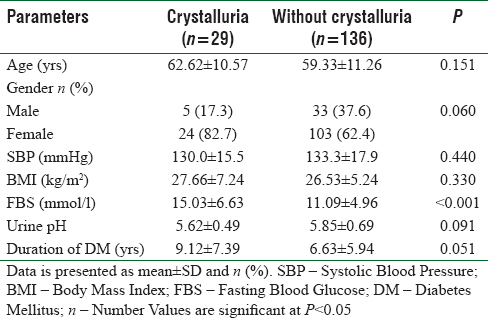 [Table 3] shows the distribution of various crystal species by BMI in T2DM participants. The proportion of crystals within various BMI categories increased with increasing BMI. A proportion of each kind of crystal was found both in the overweight (25–29.9) and obese categories (>30). Calcium oxalate was most prevalent among the overweight, followed closely by those of the obese category. Tyrosine crystals, usually associated with pathology, were found only in the overweight and obese group. Variation in crystal species among the various classes of BMI was, however, not significant (P = 0.622). Crystalluria correlated positively with age, BMI, duration of diabetes, and USG but was not significant. Crystalluria, however, showed a significant positive correlation with FBG. Conversely, the higher the blood glucose levels, the more crystals may be found in the urine and vice versa. A negative correlation was exhibited between crystalluria and urine pH but was not significant [Table 4]. On multivariate logistic regression to identify independent risk factors associated with crystalluria, FBG remained the only significant factor (P = 0.002, AOR = 1.137) [Table 5]. The present study sought to determine the prevalence, types, and associated risks for crystalluria among type 2 diabetics in the Agona West Municipality. Our findings showed that crystalluria is more prevalent among type 2 diabetics, and calcium oxalate, uric acid, and tyrosine crystals are the most dominant. Formation of crystals in the urine of such individuals increases with increasing blood glucose and decreasing urine pH. Good glycemic control may reduce the occurrence of crystals in urine. The prevalence of crystalluria in the urine of diabetics (17.5%) was higher than that found in nondiabetics (5.0%) [Figure 2]. Similar to our finding, a cross-sectional study by Meydan et al. showed a prevalence of stone disease of 21% in patients with diabetes, compared to 8% in patients without diabetes. Another study conducted in France to determine the risk of development of uric acid crystals by T2DM individuals showed that T2DM increases the risk of development of uric acid stones. In the French study, Daudon et al. demonstrated a significantly higher serum glucose level in diabetics with crystals of all kinds, when compared to nondiabetics, also with crystals. On multivariate analysis, diabetes, a condition associated with a persistent high glucose in the blood, was an independent factor in all three models analyzed. Increasing FBG, an independent factor associated with T2DM is an indicator of poor diabetic control and insulin resistance and has also been linked with the development of a low urine pH, therefore enhancing crystal formation. Therefore, diabetes patients are more likely to have crystals in their urine, hence the finding in the present study. The type of crystals found in our participants, especially those with T2DM, clearly indicates the role of urine pH in the formation of crystals. Acidic pH favors the formation of acidic crystals (calcium oxalate, uric acid, and tyrosine) whereas alkaline pH favors the formation of crystals such as triple phosphates and amorphous phosphates, as shown in our study. A significantly low pH was a major finding among participants with T2DM, a typical finding in nephrolithiasis  and explains a similar pathophysiology of crystal formation in participants with T2DM and idiopathic crystalluria. Furthermore, there was a negative relationship between urine pH and presence of crystals. The low pH environment promoted the precipitation of poorly soluble crystals in urine, leading to more crystal formation and perhaps subsequently future stone formation. As a result of this lower pH, participants with T2DM had a higher level of urinary content and undissociated urine crystals, just as seen in normal uric acid stone formers. Individuals with T2DM are most often overweight, and an increase in fat deposition has been proven to lead to insulin resistance through the excessive generation of pro-inflammatory cytokines and the defective production of the insulin-sensitizing adiponectin., T2DM participants demonstrated increased BMI along with higher blood glucose, which are characteristics of insulin resistance and the metabolic syndrome. Insulin resistance and the metabolic syndrome in heavier individuals have been linked to a relatively lower urine pH. Unlike in previous studies, we were able to prove this association with a contrasting positive association between pH and BMI in normal healthy individuals. When compared to type 2 diabetic individuals, increasing BMI was associated with a decreasing pH, thereby predisposing individuals with T2DM to crystalluria, as seen in other studies., On multivariate analysis, however, urine pH was not independently associated with crystal formation among T2DM individuals, an implication that other factors, especially high blood glucose may also contribute to the development of a low urine pH and subsequently crystals in urine. From [Figure 3], calcium oxalate crystals increased with urine glucose with a concurrent decline and rise in calcium oxalate and uric acid crystals, respectively, at a glucosuria of “++++.” Crystalluria frequency for calcium oxalate among cases with negative glucosuria may have been influenced by intake of certain foods, hydration status, or pharmacotherapy. The current study, however, did not consider this aspect of the findings. Furthermore, a more quantitative determinant for glucosuria other than the semiquantitative visually read reagent strips was not done; hence, we could not determine any functional pathologic effect of increased glucosuria and crystalluria with regard to calcium oxalate and uric acid, a consideration for future studies. To the best of our knowledge, the present study has so far been the only one to publish this. Although obesity, age, high BP, and other conditions, when associated with diabetes, can lead to pathology associated with the kidneys, T2DM per se may be associated with the development of crystalluria. Although type 2 diabetic individuals in this study population were older and with higher BMI, factors which may both contribute to the development of crystals in urine, these were adjusted for in multivariate analysis. The present study showed that increasing blood glucose levels, the main characteristic feature of T2DM, is an independent risk factor for the development of crystals in urine. This may be due to its role in the development of a persistently low urine pH, enhancing urine crystal formation. Hence, crystalluria in T2DM may be considered an indicator of insulin resistance and poor glucose control. Acidic urine pH is mostly seen in type 2 diabetes and may be a predisposing factor to crystalluria in this study population. Good glycemic control may be a helpful in reducing the occurrence of crystalluria among type 2 diabetics. Special thanks go to the staff and laboratory personnel of the ASMH for their immeasurable contribution in making this work a success. Kumar V, Fausto N, Abbas AK, Cotran RS, Robbins SL. Robbins and Cotran Pathologic Basis of Disease. Philadelphia, Pa: Saunders; 2005. p. 1194-5. Amoah AG, Owusu SK, Adjei S. Diabetes in Ghana: A community based prevalence study in greater Accra. Diabetes Res Clin Pract 2002;56:197-205. Taylor EN, Stampfer MJ, Curhan GC. Obesity, weight gain, and the risk of kidney stones. JAMA 2005;293:455-62. Taylor EN, Stampfer MJ, Curhan GC. Diabetes mellitus and the risk of nephrolithiasis. Kidney Int 2005;68:1230-5. Daudon M, Lacour B, Jungers P. High prevalence of uric acid calculi in diabetic stone formers. Nephrol Dial Transplant 2005;20:468-9. Sakhaee K, Adams-Huet B, Moe OW, Pak CY. Pathophysiologic basis for normouricosuric uric acid nephrolithiasis. Kidney Int 2002;62:971-9. Cameron MA, Maalouf NM, Adams-Huet B, Moe OW, Sakhaee K. Urine composition in type 2 diabetes: Predisposition to uric acid nephrolithiasis. J Am Soc Nephrol 2006;17:1422-8. Kirkendall WM, Burton AC, Epstein FH, Freis ED. Recommendations for human blood pressure determination by sphygmomanometers. Circulation 1967;36:980-8. Meydan N, Barutca S, Caliskan S, Camsari T. Urinary stone disease in diabetes mellitus. Scand J Urol Nephrol 2003;37:64-70. Daudon M, Traxer O, Conort P, Lacour B, Jungers P. Type 2 diabetes increases the risk for uric acid stones. J Am Soc Nephrol 2006;17:2026-33. Abate N, Chandalia M, Cabo-Chan AV Jr., Moe OW, Sakhaee K. The metabolic syndrome and uric acid nephrolithiasis: Novel features of renal manifestation of insulin resistance. Kidney Int 2004;65:386-92. Pak CY, Sakhaee K, Peterson RD, Poindexter JR, Frawley WH. Biochemical profile of idiopathic uric acid nephrolithiasis. Kidney Int 2001;60:757-61. Eckel RH, Grundy SM, Zimmet PZ. The metabolic syndrome. Lancet 2005;365:1415-28. Stumvoll M, Goldstein BJ, van Haeften TW. Type 2 diabetes: Principles of pathogenesis and therapy. Lancet 2005;365:1333-46. Maalouf NM, Sakhaee K, Parks JH, Coe FL, Adams-Huet B, Pak CY, et al. Association of urinary pH with body weight in nephrolithiasis. Kidney Int 2004;65:1422-5.